Homemade, rustic chandeliers are the perfect way to add a bit of elegance to simple, country décor. Incorporate traditional rustic elements, such as a wagon wheel, as a base for a DIY chandelier. Lend a little shabby chic charm to the chandelier project by using mason jar globes for the lights. By using battery-operated candles instead of plug-in electrical components, these rustic light sources are available for use both indoors and outdoors. Hang wagon wheel chandeliers from the trees for a rustic, garden-party wedding. Cut 20 pieces of floral wire. Each piece should be about 10 inches long. Rub the wagon wheel with medium-grit sandpaper. This will help roughen up the surfaces, preparing the wheel for painting. Place the wagon wheel and the floral wire pieces on a clean, dry drop cloth. Paint the items using white spray paint. Spray in long, even strokes to create a thin coat of paint. Allow the items to dry. Flip them over and paint the opposite side. Allow the items to dry and then touch up if necessary. 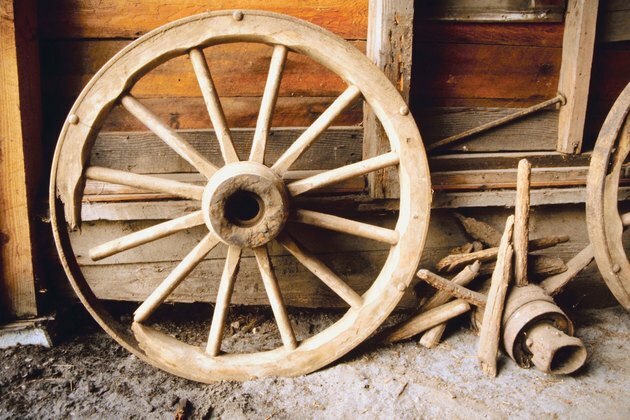 Use a medium-grit sandpaper to create a shabby chic finish on the wagon wheel. Gently rub along the details on the spokes and around the edges of the wheel. Rub until the white paint comes off, exposing the original wood finish on the wagon wheel. Determine how far the chandelier should hang from the ceiling, porch beam or tree branch. Add 6 inches to this distance. Cut four pieces of thin rope that equal this revised measurement. Count the number of spokes on the wagon wheel. Divide the total number of spokes by 4. Tie the end of one rope around a spoke on the wheel. Count over the number of spokes determined by your previous division. Tie the second rope on this spoke. Repeat with the remaining two spokes. When you hold up the wheel by the ropes, the wheel should sit flat. Take one piece of floral wire and one of the wide-mouthed mason jars. Remove the lid from the jar. Twist the wire around the mouth of the jar. Twist the tails into a small loop. Repeat with the remaining jars. Cut 19 pieces of fishing line. Vary the lengths of the fishing line, cutting pieces measuring between 4 and 10 inches. Cut one piece of fishing line measuring 16 inches long. Tie a piece of fishing line to the wire loop on a jar. Repeat with the remaining pieces of fishing line and jars. Select the jar with the longest piece of fishing line tied to the wire loop. Tie the opposite end of that fishing line around the middle of the wagon wheel. The jar should hang below the wheel when the wheel is held up by the rope ties. Tie the remaining pieces of fishing line on the wagon wheel spokes. Space the jars evenly around the wheel, creating additional visual interest with the varied heights of the jars. Place a battery-operated tealight candle into each of the jars. To light the chandelier, turn on the candles before placing them into the jars. Hang the wagon wheel from a tree branch or porch beam by tying the ropes around the branch or the beam. To hang a wagon wheel chandelier from the ceiling, screw four hooks into the ceiling where the chandelier will hang. Tie loops into the ends of the ropes. Fit the ropes over each of the hooks.